In the text marketing industry, restaurants fit the perfect mold for a well-qualified user. Restaurants have loyal and consistent customer flows. Combine that with a highly exclusive text marketing campaign and you’ll have yourself a recipe for a very healthy opt in rate. Mulberry St. Pizzeria is a restaurant that specializes in Italian cuisine with a specialty in Pizza. They teamed up with SlickText.com to help develop a solid growth strategy and help them build their subscriber base. They put a twist on the outlined methods that the text marketing team here at SlickText laid out in their unique growth strategy. They used a very simple concept of called, “Exclusivity”. The strategy included custom designed signage, Table Tent flyers, and employee guidance techniques for verbally asking customers to join their text list. Mulberry’s posted fliers that our team designed in conspicuous places for visitors to see. They then filled table tents with smaller versions of those full sized flyers. With extra portions of the small flyer, they started handing them out with every take out order and receipt. This allowed non-members at home to join the list and start receiving the exclusive text marketing deal. The last technique here, which proved to be the most effective, involved getting the employees active in the process. For every customer that came in and made a purchase, the employee would verbally ask the customer to join their VIP text list. The incentive was to get receive a great deal on their current purchase; however purchase was not necessary to join the list. 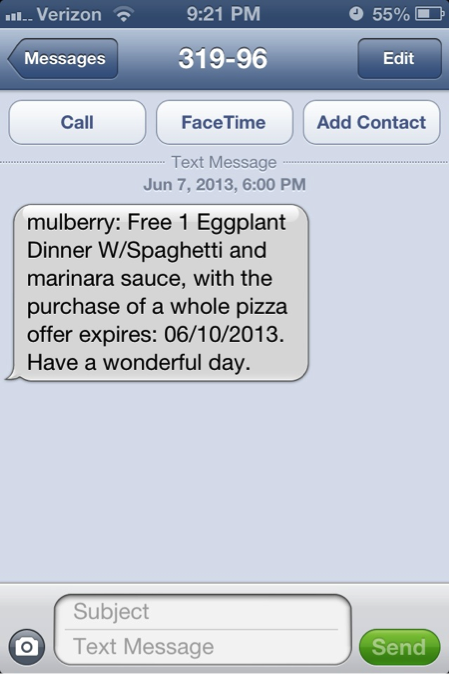 The real growth started when Mulberry St. Pizzeria started sending out their text marketing campaigns. As outlined in SlickText’s guideline for the perfect text Message ,Mulberry’s follow a cardinal rule in text marketing. They made the campaigns completely EXCLUSIVE. Not only was the campaign exclusively for the VIP text members but it also provided an appetizing amount of value as well. Below is an example of one of their exclusive, high value campaigns. From this campaign you can see all the things they did to make this text message a success. It provided a high value offer but was also time pressured by placing a expiration stamp in the message. Now, the one thing we do not see in this particular example is the requirement to make the customer show the text message. This is because Mulberry St. was treating it as a way to get customers in the door. Once a customer was in the restaurant, the employee would ask the them to join their text marketing list. At that point the servers would inform them that they could receive the deal today if they joined the list then or could prove, by showing the text, that they were already on the list. As more and more people came in for the deal they brought friends whom weren’t on the list but ended up joining because they wanted to receive the deal as well. The key point here is that the exclusiveness of the campaign enticed others opt into their text marketing list. This is how Mulberry St. Pizzeria spiked their text marketing list growth by 1000 subscribers in just 6 months. If you are interested in getting the ball rolling on your own text marketing campaign, get in touch with us. We would love to help you grow and get results using this powerful marketing medium. Feel free to contact us any time at 1-800-688-6290.